Safe PST Backup for Microsoft Outlook - Free tool to backup Outlook PST files. Backup Outlook PST files automatically using Safe PST Backup. It is an easy to use Free tool to back up and archive email automatically. Create backup of all or selected Contacts, Calendar, Tasks and other Microsoft Outlook folders with a few clicks. The backup will be done in the background regardless of whether Microsoft Outlook is running or not. 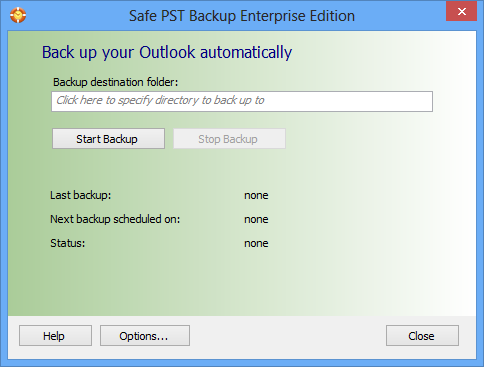 Safe PST Backup uses incremental backup model to back up and transfer only changes made to Outlook items. Save selected Outlook PST and OST files to restore them at any moment. Schedule and back up Outlook at specified time intervals or back up selected PST files manually. Upgrade to Safe PST Backup Enterprise Edition and get: * Backup Microsoft Outlook on every machine in your corporate network. * Backup Exchange folders and OST files. * Browse or scan folders and select PST or OST file from any Outlook profile. * Silent mode with interface fully hidden on clients' machines. * Fully customizable backup using scripts. * Manage backup logs, receive them via email. * Administrator only mode. * Remote control from administrator's PC. * Filter items to back up. * Easily integrated with existing backup solutions. Custom Outlook and Exchange backup solution for your company. 4Team will develop Outlook and Exchange backup tool designed specifically for your needs. For example: * Back up Microsoft Outlook as soon as changes occur. * Windows domain rules and group policy support. * Back up personal data along with Outlook items. * AES 256 bit security to protect your Outlook backup from unauthorized access. * Comprehensive and centralized reports.